What this tells me is that each day, I receive a forecast for the next three days. Note that in the real world, I may receive a forecast each hour (DateOfForecast) for the next 48 hours ('DateInQuestion') at 15 minute granularity. How do I use this data? There are several use-cases, all with subtle but important differences. I'll go through them below. This is where I want to see what the data looked like at a specific point in time. In example below, I'm showing what the data looked like on the 2nd of January. 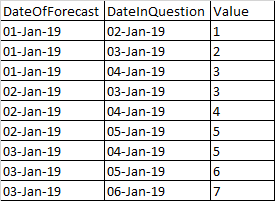 I will skip the screenshot here - this would show the forecast created, for example, on the 2nd of January and would show all records where the 'DateOfForecast' is 2nd January. The description (meta) for each data set is stored in a separate system and need not be repeated in any replacement. The frequency of publication (number of forecasts per day) can be between 1 and approximately 48. The horizon (how far out being forecasted for) can vary between one hour and one year. The granularity (length of period in DateInQuestion) can be anything from 1 minute to one month. It is, however, consistent within a dataset. In my current RDBMS database, I have around 2TB of data. Horizon of data retrieval by query, for any example above, can be from one period (DateInQuestion) to several years. So, leading on to my question!! I have being looking into NoSQL databases generally (i.e. not focussing on a single implementation). However, most case studies I have came across follow a more '[date,value]' structure and do not address the query use cases I have mentioned. Does this data lend itself well to NoSQL? Can you suggest an object design for NoSQL? Please comment if any of the above is unclear and I will try to clarify. Update 1 Any future database can be either 'on-prem', AWS or Azure. It must be usable from a variety of technologies such as .Net, Excel and Python. Obviously I can provide an API layer to address this if needed. Browse other questions tagged database-design nosql or ask your own question.